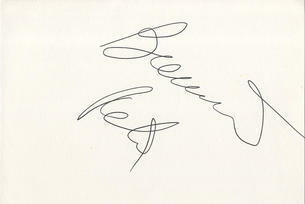 This is an In Person signed white card 5.75" x 4" by the American Actress and Singer. Bernadette Peters (born Bernadette Lazzara; February 28, 1948) is an American actress, singer and children's book author from Ozone Park, Queens, New York. Over the course of a career that has spanned five decades, she has starred in musical theatre, films and television, as well as performing in solo concerts and recordings. She is one of the most critically acclaimed Broadway performers, having received nominations for seven Tony Awards, winning two (plus an honorary award), and nine Drama Desk Awards, winning three. Four of the Broadway cast albums on which she has starred have won Grammy Awards. Regarded by many as the foremost interpreter of the works of Stephen Sondheim, Peters is particularly noted for her roles on the Broadway stage, including in the musicals Mack and Mabel, Sunday in the Park with George, Song and Dance, Into the Woods, Annie Get Your Gun and Gypsy. Peters first performed on the stage as a child and then a teenage actor in the 1960s, and in film and television in the 1970s. She was praised for this early work and for appearances on The Muppet Show, The Carol Burnett Show and in other television work, and for her roles in films like Silent Movie, The Jerk, Pennies from Heaven and Annie. In the 1980s, she returned to the theatre, where she became one of the best-known Broadway stars over the next three decades. She also has recorded six solo albums and several singles, as well as many cast albums, and performs regularly in her own solo concert act. Peters also continues to act in films and on television, where she has been nominated for three Emmy Awards and three Golden Globe Awards, winning once.